To kick off Northern Nevada Pride Weekend, Drag Olympics: The Art of Drag, better known as “Drag Wars”. is set for Friday, July 27, on the Plaza at Harrah’s, next to the Reno Arch in downtown Reno, with gates opening at 6 pm for this annual event of hilarity. A Torch Run will open the event. The music starts a chair is taken and he who doesn’t get to sit is out. It does get interesting in the end. “Drag Wars” is the official first event of weekend celebration of Northern Nevada Pride. Hosting the event is Stephanie Nicole Le Dream, who has hosted the event since it started. Co-hosting this year will be Lotta Dee. Local drag queen Adonna Does Moore will be doing an installation. 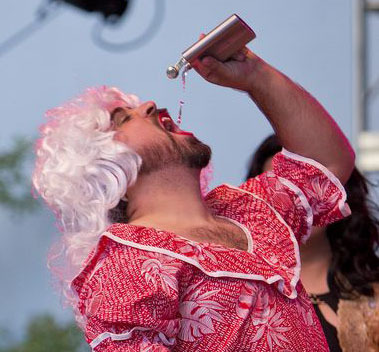 “Drag Wars” features Drag Kings (women) and Drag Queens (men) competing against each other for points during each challenge. A Drag King and Drag Queen with the highest numbers of points with be declared the winner. There will also be a People’s Choice winner named. Winners receive a Medal, bragging rights and a cash prize. will 2015 fan favorite Tay Kee La return in 2018? Each contestant will be required to sign a wavier to participate. Contestants interested in participating should send a picture of themselves as your persona (meaning how you look in drag). Include a 30 word description of you and what you’re about. The only rule is you must be available on Friday, July 27. If you are active with a non-profit please include that too, so we can promote it. Send the picture and info to Meredith@ourcenterreno.org. 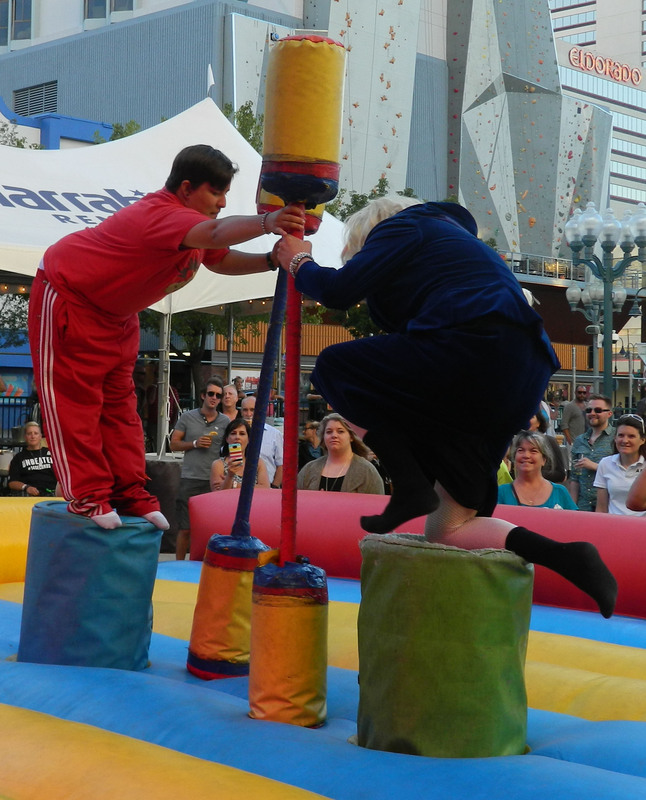 Contestants participate in Musical Chairs; Bear Wrestling; Luge Race with a Partner; The High Jump (Velcro Wall); Jousting and Hungry Hip-Hos. Each contestant will be required to sign a wavier to participate. 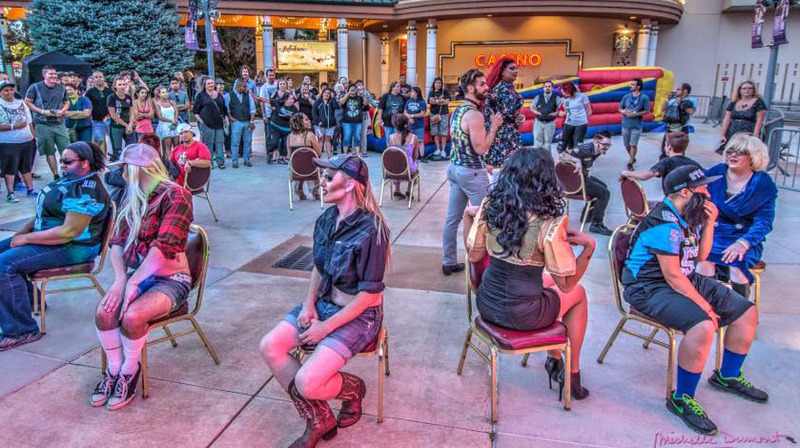 After the huge success at the Last Drag Wars in 2017, the community has been looking forward to this night of fun, merriment and good times to start Reno’s Pride Weekend. Organizers are hoping to have 300 or more people in the plaza for the event. Admission to Drag Wars on the Plaza at Harrah’s is $7. For those who come in drag $3 will get you in. The event is open to all ages and is just about having fun. The Fab Home Team is the sponsor for the return of Drag Wars. Therenogaypage is a proud media sponsor of Northern Nevada Pride Weekend.